Named a Super Lawyer for 2016, Michael Ciarlo has been with Nadel & Ciarlo, P.C. since 1999, providing successful and experienced results for our clients. During this time his extensive knowledge of commercial, business and real estate litigation has benefited the clients of the firm. He has a wide-range of experience negotiating, analyzing, resolving and litigating all aspects of real estate, business, co-op, condo and landlord/tenant matters. Mr. Ciarlo brings a significant depth of understanding to his role in advising large and small business, co-ops, condominiums, landlords, tenants and individuals in their disputes and litigation. 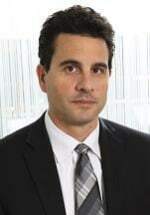 Mr. Ciarlo graduated New York University with honors in 1995 and then obtained his law degree from Brooklyn Law School in 1998. He was admitted to the bar in both New York and New Jersey in 1999. Mr. Ciarlo regularly appears in both the Civil Court of the City of New York and the Supreme Court of the State of New York in all types of commercial and real estate litigation.